This thing looks primitive - a single density 8" FDC on two boards! However you should remember is was designed at a time before the Western Digital 179x LSI chips, even before a time when it was agreed all S-100 boards would sit in a card cage that want front to back in a computer box rather than side to side as was the case for the Altair. Thus the connections coming out of the side of the boards. Needless to say you never found this board in other S-100 systems. The board consisted completely of standard 7400 series TTL logic. The 18 twisted pair flat cable with two 37 pin connectors connected the two boards together AND connected to a separate unit containing the 8" floppy disk(s) and power supply. The board had hard wired I/O ports (10H to 12H). 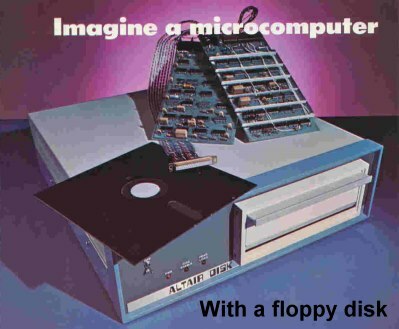 Altair supplied the boards in kit form along with a kit to build the 8" Floppy disk unit with its own power supply. They also supplied some very simple software to checkout your finished system. The code was listed in Octal! The detailed construction manual for this board can be obtained here.